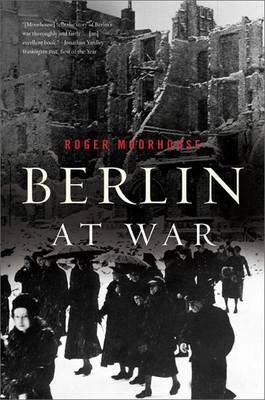 In Berlin at War , acclaimed historian Roger Moorhouse provides a magnificent and detailed portrait of everyday life at the epicentre of the Third Reich. Berlin was the stage upon which the rise and fall of the Third Reich was most visibly played out. It was the backdrop for the most lavish Nazi ceremonies, the site of Albert Speer's grandiose plans for a new world metropolis," and the scene of the final climactic battle to defeat Nazism. Berlin was the place where Hitler's empire ultimately meet its end, but it suffered mightily through the war as well not only was the city subjected to the full wrath of the Soviet ground offensive and siege in 1945, but it also found itself a prime target for the air war, attracting more raids, more aircraft, and more tonnage than any other German city. Combining ground-breaking research with a gripping narrative, Moorhouse brings all of the complexity and chaos of wartime Berlin to life. Berlin at War is the incredible story of the city,and people,that saw the whole of this epic conflict, from start to finish.